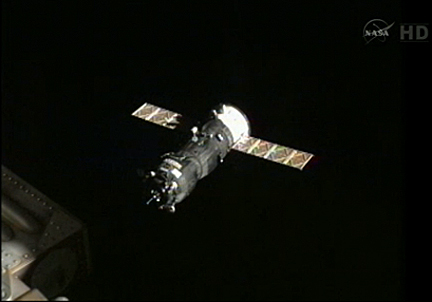 A Russian Progress cargo ship loaded with three tons of fuel, hardware and supplies, glided to an automated docking with the International Space Station Wednesday evening after an abbreviated four-orbit rendezvous. Progress supply ships normally take 50 hours or so -- 34 orbits -- to reach the space station, but Russian flight controllers are evaluating techniques to dramatically compress the rendezvous procedures used by manned Soyuz spacecraft to reduce the amount of time crews spend cooped up in the cramped ferry craft. The Progress M-016M spacecraft was launched from the Baikonur Cosmodrome in Kazakhstan at 3:35 p.m. EDT Wednesday, climbing smoothly into orbit just a few minutes after the space station passed overhead. The station's orbit, along with launch timing, must be carefully orchestrated to make an accelerated rendezvous possible and at the time of liftoff, the station was just 2,360 miles ahead of the cargo ship. Four large rendezvous rocket firings were carried out in close succession as required and the Progress M-16M spacecraft's docking system engaged its counterpart at the base of the station's Pirs module at 9:18 p.m. The spacecraft was loaded with 1,962 pounds of space station propellants, 110 pounds of oxygen, 925 pounds of water and 2,817 pounds of science gear, spare parts and crew supplies. "Congratulations," chief flight director Vladimir Solovyev radioed the crew from the Russian mission control center near Moscow. "It's an achievement." But he quickly added, "It's just a start, we have to move slowly, step by step." "It's the dream of every cosmonaut and astronaut to be at the station as soon as possible, in a warm environment with hot meals," space station commander Gennady Padalka replied in translated remarks. The abbreviated rendezvous technique may be tested again during a Progress flight in November, officials said, but it's not yet clear when a manned Soyuz might attempt a same-day docking.